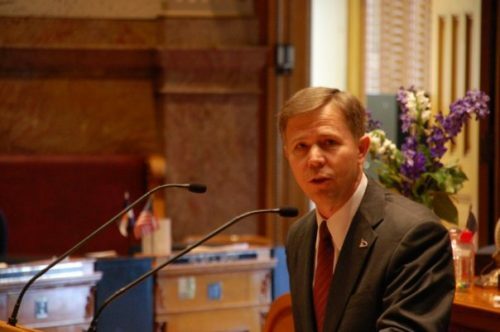 In a shocking move of anti-gay vengeance, Republican state legislators have stripped funding from the Colorado Civil Rights Commission. The commission is at the center of the Masterpiece Cakeshop case currently in front of the Supreme Court. After owner Jack Phillips refused to make a cake for Charlie Craig and David Mullins, the two gay men filed a complaint against the baker with the commission alleging discrimination based on sexual orientation. The commission agreed with the men, as did the Colorado Court of Appeals. The legislators are using a transparent excuse to hide their motivations. State Senator Kevin Lundberg, who sits on the Joint Budget Committee that defunded the commission, says he voted for the measure because the law authorizing the commission expires in this session and will need to be renewed. Democrats who sit on the budget committee, however, pointed out that Lundberg’s argument doesn’t hold water. Democratic Governor John Hickenlooper agreed that defunding the commission was an atrocious act of bigotry and vengeance. “Refusing to fund the commission is puzzling at best, and sends the wrong message to Coloradans – and businesses looking to move to Colorado – on the state’s commitment to equal rights,” Hickenlooper’s spokeswoman, Jacque Montgomery, said in a statement to the Post.